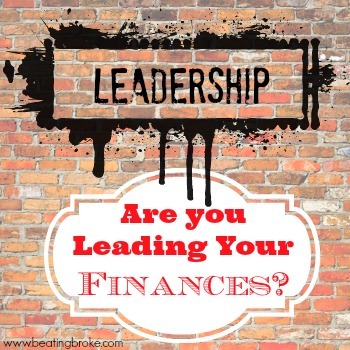 Are You Leading Your Finances? This last weekend, I attended a young professionals conference. As you can imagine, a large part of the conference was spent talking about leadership. One of the speakers was legendary basketball coach Dale Brown. One of the breakouts was entitled “Visionary Leadership”. I’ve also just started reading the book “Entreleadership” by Dave Ramsey. In all of those places, there are lots of buzzwords that describe leadership, and what a leader is. Of course, this being a personal finance site, my mind couldn’t help but apply as much of it as possible to personal finance. When we think of our personal lives, we rarely apply the word leader to any aspect of it. We apply it to ourselves and others in our work and volunteer lives, but not our personal lives. Why not? When it really comes down to it, we are the leader of our lives. We are the ones who apply the same principles that leaders apply to business and volunteer organizations to our lives. Or don’t. We try and become better leaders at work. We expect better leaders to lead us. But rarely do we try and become better leaders in our personal life. Personal finance aren’t all that much different from a business and a business’ finances. We still have income coming in, expenses going out, and the profit left over. Unfortunately, for many, that’s where the parallels end. Let’s change that. Let’s apply some of those leadership principles to our lives. Specifically, let’s apply them to leading your finances. Business leaders are always looking for ways to make their business and employees more efficient. Over the years, businesses have foregone the paper and pen and replaced them with computers. They’ve replaced old marketing tactics with websites and social media. Leading your finances means finding, and embracing, new ways to make your finances more efficient. Forego the old check and envelope method of paying your bills and sign up for bill-pay. Or automate your bill paying by setting them up for auto-pay. Find ways to save that also create income. Look into better rates at better banks. Learn about dividend investing. Learn about peer-to-peer lending. Many of today’s biggest and brightest businesses wouldn’t even exist today if their leaders hadn’t been continually opportunity seeking. If all Apple still made was computers, it wouldn’t be the multi-billion dollar company that it is today. If Steve Jobs hadn’t seen the opportunity in the iPhone, iPod, and iPad, they’d be just another company making computers. Apply the same to your finances. Peer-to-peer lending hasn’t always been what it is today. There was a time where it was still a fledgling opportunity. A small percentage, relatively, of the population saw the benefit of it as an investing avenue, and, for most, their finances are the better for it. Be open to services and products that can help you make your finances better. Good enough is never good enough for a business leader. The only thing that stays the same is their desire for improvement. Beyond always seeking opportunity, we must also always be finding ways to improve our finances. We must always be assessing the risk involved with those new opportunities, and making decisions on what will best improve our finances. Businesses fail. If they have good leaders, they only fail momentarily and spring back stronger than ever. They’ll have set the company up to be diversified so that any one failure shouldn’t be enough to ruin the company. Investors talk all the time about the importance of diversifying an investment portfolio. But, it can be applied elsewhere in our finances. Having all of your money in one online bank is great. Until your internet goes down and you can’t get to it to bill pay. Diversifying to have a set amount of cash available in an emergency can help you out there. Not depending on just stock investments is another great way to diversify for failure. Prepare your finances so that an opportunity that fails only sets you back, doesn’t bankrupt you. How can you improve your finances today? What opportunities can you learn more about and assess for use in your finances? What efficiencies can you create to make your finances better? What other leadership qualities can you apply in leading your finances? I operate my finances as if it were a business! I am constantly reviewing and analyzing my expenses. It takes very little time. I think about ways to increase revenue and the effort involved. The biggest part of the work is planning, particularly the future. I think it is why I am successful! I’m trying to run my finances like a business, making efficiency where possible and cutting deadweight or under performing assets while I try and grow my revenue and cash flow. I like auto pay for things like auto insurance and utility bills, but sometimes it’s reassuring to write a check, log it in the register, and balance the account each month. It ultimately comes down to how often you’re checking up on your finances. Just like a business owner examines the employees performance on a regular basis, it is important that we sit down once a week to pay a “visit” to our personal finances. I’ve found that if we do the little things right and consistently that this process takes a matter of minutes. I can forego Duck Dynasty or (for the ladies) The Bachelor in order to make sure my finances are on track. The points regarding financial efficiency and financial failure are very good. It shows that leadership is important in financial management. We have a lot to learn.